Umbrellar Online Review 2019: Is Umbrellar Online a Good Hosting? Umbrellar Online is the web hosting arm of New Zealand cloud solutions company Umbrellar. It offers basic shared hosting at reasonable prices, but with fewer features and lower data allowances than you can find elsewhere. 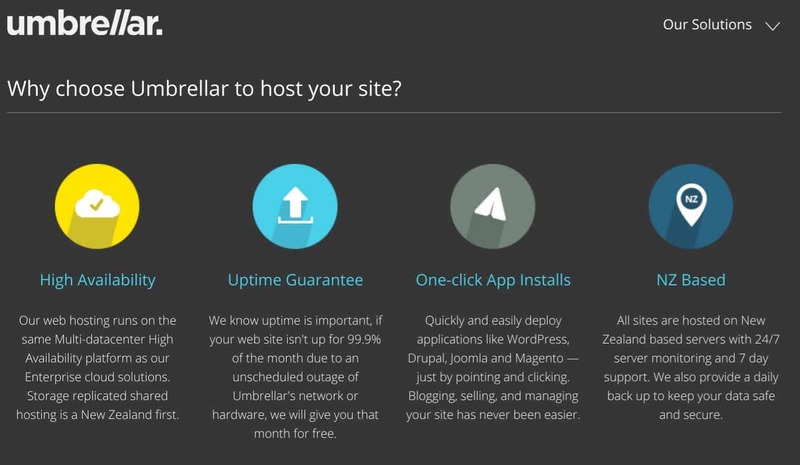 Umbrellar Online is the web hosting division of cloud solutions company Umbrellar: New Zealand’s largest hosting provider and domain registrar which has served 75,000 clients with web hosting and registered over 250,000 domains since 1997. This provider offers web hosting, email hosting, cloud services, SSL, and domain registration. Its website is in English. Umbrellar Online offers a range of web hosting, domain, and email services as well as Microsoft Cloud-based services through its main ‘Umbrellar’ umbrella company. Umbrellar Online’s website presents its plans as two types – Web Hosting and WordPress Hosting – with what looks like four same-named plans at the same prices in either case. The difference, of course, is that the second set of plans are tailored toward WordPress. The entry-level Hosting Only plan – whether WordPress or not – is preconfigured at the checkout with the Linux operating system, Standard Density, 1 GB storage, and 5 GB web traffic. You can ratchet the resources up to 50 GB storage (or custom) and 150 GB web traffic (or custom), and you can switch the operating system to Windows. You can also switch from Standard Density to High Performance, which basically means having fewer sites hosted on a single server. Umbrellar Online also offers Web Builder plans that come with the Weebly website builder which lets you create mobile-friendly responsive websites by choosing a theme, dragging and dropping elements, and adding e-commerce functionality. There are three tiers of web building plans, with the lowest plan missing features like website search, password-protected pages, and the ability to incorporate HD video or audio. Umbrellar is also a leading provider in SSL certificates in New Zealand. It offers several Comodo SSL certificates, with the starter certificate being domain-validated, having a dynamic site seal, and coming with a $10,000 warranty. Installation is included, and the certificate is issued in minutes. Compared with New Zealand-based and international hosting providers, Umbrellar Online’s prices vary from competitive to higher-than-average. While the entry-level web hosting plan is competitively priced and is similar to other local providers, this basic package doesn’t include email or anywhere near as much data as competitors’ plans. Add-ons are expensive. Registering a domain costs around twice the price of other providers, and the Weebly website builder plans are more expensive than what Weebly itself charges. You can contact the support desk via a toll-free New Zealand telephone number during business hours on Mondays through Fridays. Apparently, you can also access support at weekends for a fee. And you have the option of emailing the team, but when I emailed them, I never received a reply. Umbrellar Online’s self-support resources are scarce, but the ‘Umbrellar’ umbrella website includes a link to a Knowledge Hub which (unfortunately) seems more like a showcase for industry trends than a serious self-help resource. Umbrellar Online is the web hosting arm of the Umbrellar Group which markets itself as New Zealand’s largest web host and domain provider. It offers basic shared hosting at reasonable prices, but with fewer features and lower data allowances than you can find elsewhere. Have your website hosted under Umbrellar’s hosting umbrella. Wondering how Umbrellar Online stacks up against other Web Hosting companies? Enter any other Web Hosting company and we will give you a side-by-side comparison.